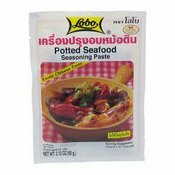 Suggested Options: This seasoning can be used with any seafoods. Allergen Information: Contains Soybean, Wheat, Sesame. Ingredients: Ginger, Soy Sauce (Soybean, Wheat, Salt), Sugar, Garlic, Coriander Root, Flavour Enhancer (E621), Vegetable Oil (Soybean, Sesame), Salt, Spices (White Pepper, Star Anise). Simply enter your details below and we will send you an e-mail when “Potted Seafood Seasoning Paste (海鮮火鍋湯)” is back in stock!